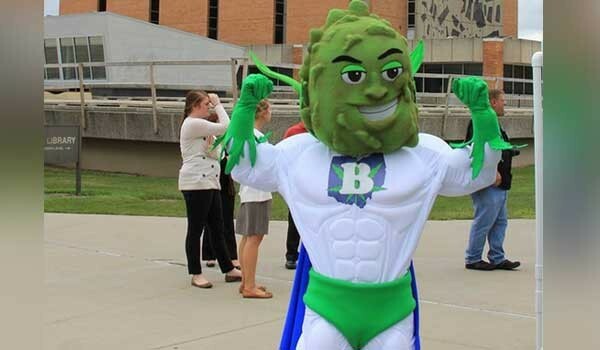 "Buddie," the ill-fated mascot for Ohio's legalization campaign. The big pot news that came out of election night was Ohio voters rejection of a ballot initiative that would have legalized both recreational and medical marijuana. Pro-pot groups were split on supporting the measure, which would have effectively established an oligopoly in the state constitution with 10 wealthy individuals having the sole right to grow pot for the new market. One of those individuals that would have been allowed to farm pot in the Buckeye State was Nick Lachey, a former member of a boy band and a reality TV star. Despite the setback, marijuana legalization groups are undeterred. The Washington Post has a rundown of all the other states considering legalization measures from the most viable to the long shots. The results of a new survey show that the Dutch, which have 40 years of experience with more-or-less legal pot, want even fewer restrictions on the drug. New York magazine has a long article about country music legend and weed enthusiast Willie Nelson. It turns out that Nelson really doesn't know that much about weed. Although Vermont has decriminalized marijuana, that hasn’t stopped law enforcement from writing even more tickets for people possessing the drug.